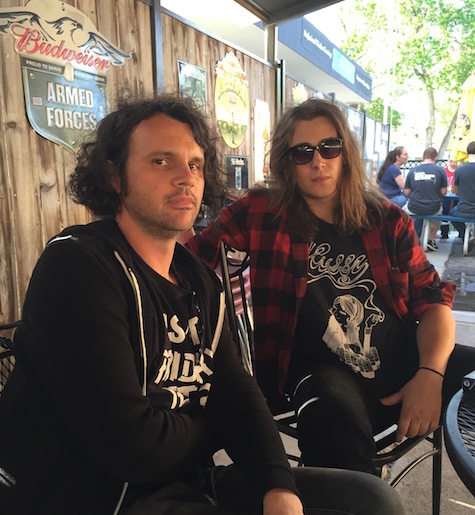 Digital Leather’s Shawn Foree, left, and Ben VanHoolandt relax in The Nifty’s beer garden. A rather lengthy feature/interview with Digital Leather came out a couple weeks ago in the June issue of The Reader. I’ve been sitting on it because the band’s new album, All Faded (FDH Records) won’t be released until next Tuesday, June 23. But since Noisey today began streaming the entire album I figured now is as good a time as any to point you to this rather controversial Reader article (It’s already receiving hate mail), online here. The genesis of the story was an interview conducted in late May with Digital Leather frontman Shawn Foree, bassist Johnny Vredenburg and synth/keyboard player Ben VanHoolandt at classic midtown dive bar The Nifty. What ensued was two hours of interview, every second of it digitally recorded. The transcribed recording weighed in at just under 100 pages of single-spaced type, and reads like a twisted off-Broadway play. In fact, it dawned on me that it would be fun to recreate the interview verbatim on the Bluebarn stage, with the names changed to protect the innocent (of course). Needless to say, I got to ask all the questions I’ve been dying to ask Foree and Co. since I began listening to Digital Leather shortly after Foree’s arrival in Omaha sometime around 2009, including why they don’t play songs off Warm Brother, the meaning behind their seminal anthem “Studs in Love,” and how Jay Reatard influenced Foree’s songwriting. The story also covers how the band first got together, the making of the new album, Foree’s pursuit of a Pitchfork review and future pursuits. It clocked in at just under 2,000 words and is a double-page spread in the current issue of The Reader. But, as I said, you can read it online here. Check it out, listen to the Noisey album stream, and buy a copy when the record hits shops next week. And get ready for DL’s performance at Dog Fest at O’Leaver’s June 27. Speaking of fabulous O’Leaver’s, the club is in the midst of a rather busy week with shows nearly every night, including tonight when Dave Dondero headlines. I’m not sure what Dave’s been up to lately because his website hasn’t been updated since 2013, but it’s still worth a visit just to check out the sweet photo of a Union Pacific train rolling through dusty bluffs outside of Salt Lake City. Also on tonight’s bill is roots/punk rocker Al Scorch (Orange Twin Records). $5, 9:30 p.m.
Also tonight, Detroit funk/garage/novelty band Electric Six (XL, Metropolis) headlines at The Waiting Room with White Reaper. $13, 9 p.m.